Grandma P and I have been fortunate in that we have done extensive traveling and have visited over fifty countries. Many, but not all, of these visits were done from the comfort of a cruise ship. In many instances, a one-day visit was more than enough. The one thing that Grandma P and I agree on during these travels is the definition of poverty, of being poor. We both agree that most Americans have not seen what real poverty looks like. How many people live in the United States in houses that lack both windows and doors and have dirt floors? Not too many. Yet, we have seen it many times in countries in the Caribbean and in both Central or South America. Who knew? Did you know that our protectorates receive welfare? Want to guess who is paying for this? Oh yeah, the American taxpayer. We are also paying for Guam, Puerto Rico and the Virgin Islands. I digress. One of the most poverty stricken cities we have visited is Cairo, Egypt. Pretty much everything is filthy and dust covered. The Cairo system of garbage removal is to push all garbage into the Nile river. When the spring floods come, it all gets washed north to the Mediterranean. If Egypt did not have the pyramids or the sphinx, tourists would never go there. Talk about poverty! “There is no material poverty in the United States. Here are a few facts about people whom the Census Bureau labels as poor. Dr. Robert Rector and Rachel Sheffield, in their study “Understanding Poverty in the United States: Surprising Facts About America’s Poor,” report that 80 percent of poor households have air conditioning, nearly three-quarters have a car or truck and 31 percent have two or more. Two-thirds have cable or satellite TV. Half have one or more computers. Forty-two percent own their homes. Poor Americans have more living space than the typical non-poor person in Sweden, France or the United Kingdom. The Census Bureau pegs the poverty rate among blacks at 35 percent and among whites at 13 percent. The illegitimacy rate among blacks is 72 percent and among whites it’s 30 percent. A statistic that one doesn’t hear much about is that the poverty rate among black married families has been in the single digits for more than two decades; it’s currently at 8 percent. For married white families, it’s 5 percent. Is anyone willing to advance the argument that the reason the illegitimacy rate among blacks was lower and marriage rates higher in earlier periods was there was less racial discrimination and greater opportunity? No one can blame a person if he starts out in life poor, because how one starts out is not his fault. If he stays poor, he is to blame because it is his fault. Avoiding long-term poverty is not rocket science. First, graduate from high school. Second, get married before you have children, and stay married. Third, work at any kind of job, even one that starts out paying the minimum wage. And finally, avoid engaging in criminal behavior. It turns out that a married couple, each earing the minimum wage, would earn an annual combined income of $30,000. The Census Bureau poverty line for a family of two is $15,500, and for a family of four it’s $23,000. By the way, no adult who starts out earning the minimum wage does so for very long. Today’s total of $18 trillion spent on poverty means you could purchase everything produced in our country each year and then some. Whew! I could not have said any of this better than Walter Williams himself did in his article. If you are not familiar with any of Walter’s articles, you should acquaint yourself – right after you read mine. His perspective is both astute and refreshing. My heart rate has just jumped! Olympic curling is back on the TV. You must be familiar with curling. It is the only Olympic sport where a fat man with a beer gut can realistically fantasize about being an Olympic medal winner! Those other sports are too physical and would actually require me to move off the couch and train! Pass the pretzels. This entry was posted in Political Opinion and tagged budget resolution, Dr. Walter Williams, Lyndon Johnson, Walter Williams, welfare on February 18, 2014 by Grandpa T.
Frankly Scarlett, I Do Give a Damn! If I were alive during the Civil War, I now realize I would have fought for the Confederacy! Those are harsh words for someone born and bred a true Yankee. My fight would be to preserve ‘states’ rights’! Unlike the current administration with their approach to such things as Iran, Iraq or Afghanistan, President George and I actually have a strategy and a goal. Our goal is to protect ‘states’ rights,’ just as the Confederacy fought for during the previous Civil War. Our strategy is to rid ourselves of all those scallywags in Washington D.C. that are opposed to and unsupportive of our belief in states’ rights! This is similar to what the Confederacy was attempting to do during the Civil War. Why have we foisted our banner to such an undertaking? Here are examples of government intervention in areas where they have no business. On August 24, 2011, federal agents from the Department of Justice executed four search warrants on the Gibson Guitar Corporation. They have facilities in both Nashville and Memphis, Tennessee. This was done because the company supposedly imported ‘illegal tonewood (rosewood)’ for the construction of their guitars. This was in violation of a century-old Lacey Act which outlaws trafficking in flora and fauna which has broken foreign laws. Did they send an accountant or scientist to get samples of the supposedly illegal wood? No! They sent over 30 agents in SWAT gear with weapons to evacuate the three facilities of employees. They then disconnected the surveillance devices and confiscated electronic files, pallets of wood and guitars. The federal government pursued this even though both India and Madagascar, the largest suppliers of rosewood, insisted that none of their laws were broken! The end result of this abuse of federal authority was that Gibson had to pay a $300,000 fine, and make a contribution of $50,000 to the National Fish and Wildlife federation. They did this to avoid a bankrupting legal battle. As it turned out, they still accumulated over $2.4 million in attorney fees. Ironically, the guitar company’s two biggest competitors are Fender Guitar and Martin Guitar Corporation. Martin Guitar advertises in their catalog the use of Western India rosewood in the construction of all their guitars. This is the same rosewood from the same country that was confiscated from Gibson. By now, you are probably wondering why one company was targeted, and two others were not. The answer may lie in the fact that 2011 was an election year, and the CEO of Gibson Guitar contributed to candidates of the Republican Party. Huge contributors to the Democratic Party include both presidents of the other two guitar companies, especially Martin Guitar CEO, Chris Martin IV. Have you not heard about this? Actually, I only learned of this whole incident two weeks ago myself! Abuse of federal power! Rally the troops! Mount your horses! Robert E. ‘Grandpa T’ will lead to Washington! Those federal scallywags outdid themselves again by using the IRS to bully and harass specific groups prior to the last presidential election. For the next two years, the IRS approved the application of only four such groups, and delaying all others while subjecting the applicants to highly intrusive, intimidating requests for information regarding their activities, membership, contacts, Facebook posts, and private thoughts. A clear abuse of federal authority! The chilling turn of events was that the director of the IRS did eventually resign after pleading the Fifth Amendment numerous times during congressional hearings. Isn’t it ironic that there was rampant and blatant abuse of the First Amendment, but convenient overuse of the Fifth Amendment! Since her resignation, the replacement director has since resigned as well. As of this date, no person within the IRS have been terminated as a result of this incident. But wait! The Department of Justice has appointed an investigator to look into those darn accusations that just don’t seem to go away for the current administration. Who did they appoint? Her name is Barbara Bosserman. Her claim to fame? She has donated over $6750 to President Obama’s campaign, the Democratic National Committee, and the Obama Victory Fund. She will really tear those IRS weenies from stem to stern! You know I am joking. Sending her to investigate the IRS would be similar to sending a fat person to close a Golden Corral buffet line. It just ain’t going to happen. The results of this investigation cannot be taken seriously. Unfurl the flag! Limber the cannons! On to Washington! 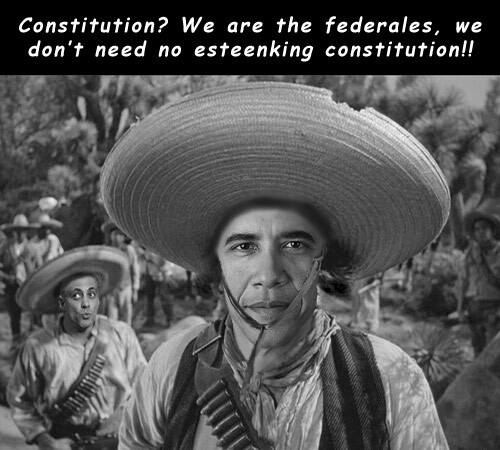 Where exactly in the Constitution is it stated that the federal government is responsible for socialistic healthcare? Yet that is exactly what has been imposed upon this country by our federal government. A bad law passed by politicians that did not read it, administered by a group of people (IRS) of dubious integrity on a population that does not want it! What could go wrong? What has gone wrong is that we are becoming a nation of ‘part-time’ employees. Until now, businesses would often provide or assist with healthcare in larger corporations. They are now opting out of these programs. Healthcare for others was a burden, but it was not totally unaffordable. Because those ‘unpatriotic’, younger people are not signing up, the cost to the remaining older population has ballooned out of sight! Corporations laid off people in anticipation of the 20-25% increase in payroll costs due to this bill. I say that the passage of this bill is largely responsible for the economic downturn we have suffered since its passage in 2008. We have recovered somewhat, but not totally. This is clearly a situation where the federal government tampered with our capitalistic system. One of the glaring weaknesses in this program is that the federal government did not require a criminal background check of any of the ‘navigators’ that are hired to assist in enrollment in the program. These ‘navigators’ will be taking every bit of sensitive information you have during the enrollment process. The result? In California alone, 43 ‘navigators’ were hired that had previous felony convictions. Some of these convictions were for fraud! I will guarantee that if this has happened in California, it is happening elsewhere. Target Corporation is still attempting to recover from stolen personal information from their ordeal with its credit card holders. How big could identity theft get at the federal government level? Would I fight for ‘states, rights?’ Would I have fought for them at the time of our Civil War? If I could have foreseen what our government was to become, you bet I would have I would have fought like a hungry man fights for the last roll at that Golden Corral buffet line! Our founding fathers had divergent opinions about ‘states’ rights’. It was the Hamiltonians versus the Jeffersonians. To simplify, the people promoting a strong centralized federal government (Hamiltonians) versus the people supporting stronger states’ rights (Jeffersonians). Our founding fathers were greatly concerned about the federal government becoming too big and too powerful – just what we have allowed to happen today. If you have digested what I have written in this blog, you will notice that the real issue is not ‘states’ rights,’ but personal freedoms. We have the current administration that has used their power to eliminate or stifle political rivals. To whit, the raid on Gibson Guitar and the IRS targeting of conservative political groups. We have a federal government that thinks they are the most efficient at providing healthcare, when they are the last organization that should run such a program. Have we learned nothing from welfare programs? Our country was founded on the system of capitalism, not socialism, but every day, in every way, we are losing our individual freedoms. The most frightening issue of all? Our POTUS saying in his last State of the Union address that he would ‘bypass Congress on legislation concerning economic recovery.” Are we talking dictatorship? ‘We the People’ are guaranteed of our rights in our founding documents, and ‘We the People’ deserve better government. Our government is too big and too powerful. Shame on us for allowing it to get this way. I, General Robert E. ‘Grandpa T’, am putting my faithful horse, old Buffet Belly in the barn. The cannons are unlimbered. The flag is furled. I will have to wait until November to further wage my ‘Civil War’ in a ballot box. This entry was posted in Political Opinion and tagged Civil War, Gibson Guitar raid, IRS Scandal, IRS targeting, personal freedom, States rights, Tea Party on February 7, 2014 by Grandpa T.